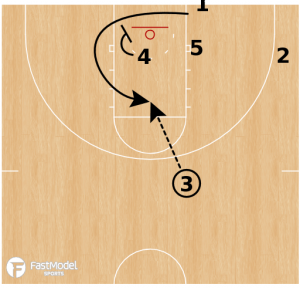 This baseline inbound play run by Cincinnati in the opening round of the 2018 NCAA tournament was posted to the FastModel Sports Basketball Plays and Drills Library by Tony Miller. Tony is the men’s assistant basketball coach at Bob Jones University in Greenville, SC. These guard-to-big and big-to-guard screens will create mismatches when defenses switch or open shots when screen defenders “show” on offensive players receiving screens. 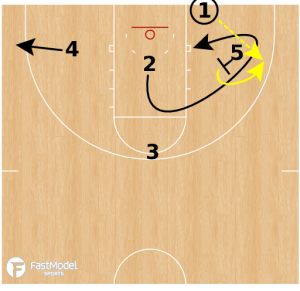 2 sets a back screen for 4. 5 sets a cross screen for 2. 1 passes to 2 for the shot. If no shot, 2 passes to 3. 4 sets a down screen for 1. 1 curls or flares for a pass from 3.